COLOR YOUR COCKTAILS COLORING BOOK. Into a chilled Champagne flute add the Creme de Cassis, top off with Chilled Champagne and garnish with frozen or fresh black currants and an optional lemon twist. The Kir Royale is a champagne version of a cocktail called Blanc-Cassis, a white wine and blackcurrant liqueur cocktail. The classic version Kir Royale is simply champagne with a splash of Creme de Cassis, a black current liqueur, though there are now many variations out there for the adventurous palate. 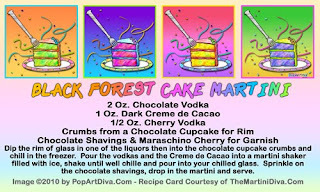 I've often done this with Chambord in place of the Creme de Cassis. Some recipes call for 4 parts champagne to 1 part Creme de Cassis though the original recipe calls for simply a splash of the Cassis. Canon Felix Kir, mayor of Dijon in Burgundy France from 1945 to 1965 is often credited as the creator of the Kir Royale, it's said Kir used the Creme de Cassis to sweeten the local low quality war time wines to make them more palatable thus "inventing" the combination of wine and cassis or "un kir". However, a wine based version, a blanc-cassis, was already in existence and called Vin blanc cassis de Dijon by Lejay-Legoute. 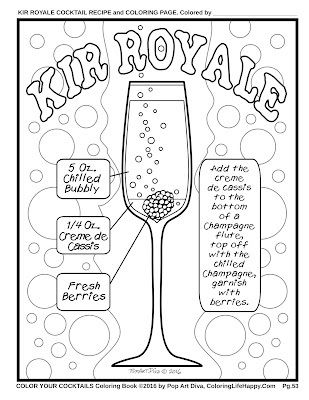 In a way Canon Kir did create the "Kir Royale" because it was named after him! During his tenure as mayor, Kir served the drink up as a promotion of the local region to visiting guests. As a result of this and his war efforts in the French Resistance, Kir was honored by Lejay-Legoute when they named their premixed black currant liqueur "un kir" (the original name of Creme de Cassis) after him. 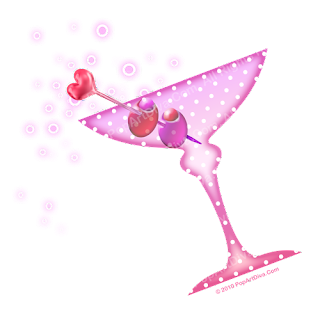 When champagne was used instead of wine it became a "Kir Royale". The Gimlet is a martini with Rose's Lime Juice instead of vermouth. It's that simple. While you might find a few recipes out there that include some simple syrup (and frankly I like it with the sweetener) - that is not a true Gimlet. The Vodka Gimlet simply replaces the gin with vodka. "a real gimlet is half gin and half Rose's lime juice and nothing else"
He's got a point - changing the Roses to fresh lime gives this cocktail an entirely different flavor as Rose's has it's own unique taste. Still, I prefer fresh juice. DIRECTIONS FOR SERVING UP Stir with ice in a mixing glass, strain into a chilled cocktail glass and garnished with a lime wedge. DIRECTIONS FOR SERVING OVER Add gin, simple syrup and lime juice to an ice filled rocks glass, stir, then garnish with a lime twist. AMCs MAD MEN lists the Vodka Gimlet as one of their classic 1960s cocktails and you'll note their recipe doesn't have the sweet element either. 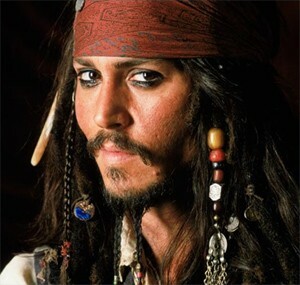 No, I'm not kidding - Would I steer you wrong? 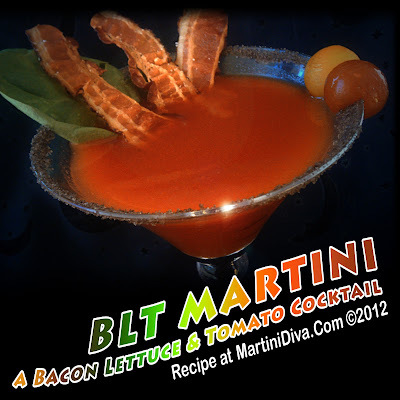 It's a Tomato Vodka Bloody Mary garnished with BACON. Garnish: Rim glass with kosher salt, add a bacon and cheese stuffed olive and a baby romaine lettuce leave. DIRECTIONS Combine the ingredients with ice in a cocktail shaker and shake until chilled. Strain into a chilled cocktail glass, garnish and serve. If you really want to amp up the bacon then replace the tomato vodka with bacon vodka! I have the recipe for Bacon Infused Vodka here. 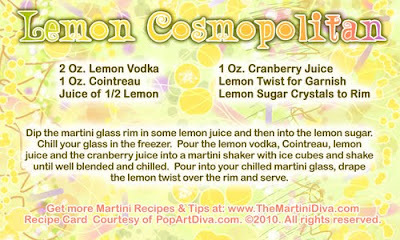 Here's a nice lemon twist on a classic Cosmopolitan. 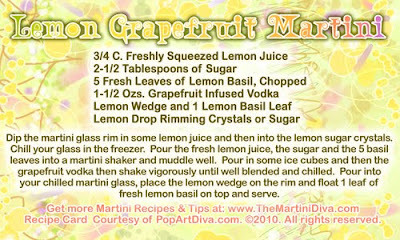 The lemon replaces the lime citrus element and becomes an even stronger flavor profile by using a lemon infused vodka. I like using the Cointreau in place of the Triple Sec because it has a stronger orange flavor which I really like with the cranberry and it has a more complex flavor than the less expensive Triple Sec. According to the IBA (International Bartender's Association) a classic Cosmopolitan does use a citrus or lemon vodka, but I like that extra citrus kick. 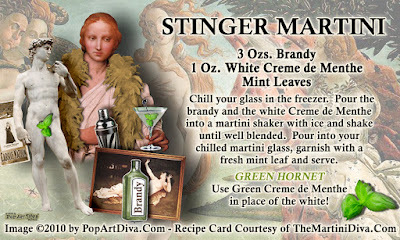 I enjoy experimenting with adding fresh herbs to my martinis and one of my favorite herbs is lemon basil. I use it on chicken, fish and a myriad of other food recipes and often with fresh lemon juice or lemon zest so this Lemon Basil Martini was the next step. 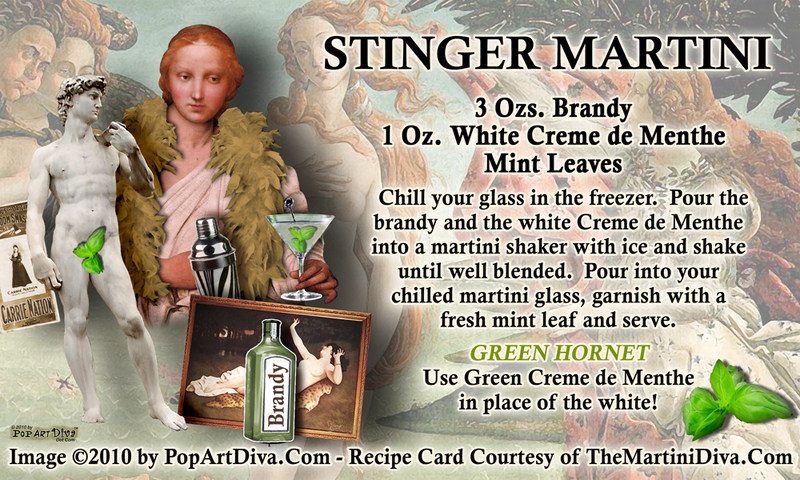 It's refreshing and the lemon basil adds a little more complexity to a Lemon Martini. It's wonderful to serve this before a meal that has also used lemon and basil. Try it out next time you get some nice fresh lemons and enjoy! 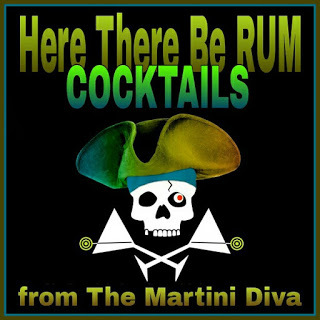 New Martini Art! 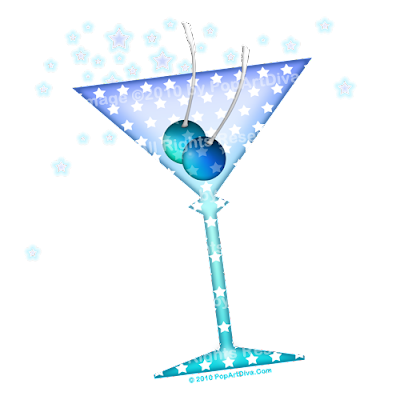 Who Needs Happy Pills When You Can Have MARTINIS? 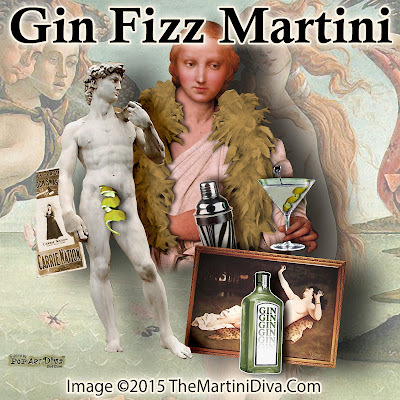 My latest martini illustration is a little bit of humor aimed at all those Happy Pill commercials out there - they drive me nuts, pardon the pun. I don't adhere to the philosophy that pills can solve all of life's problems. 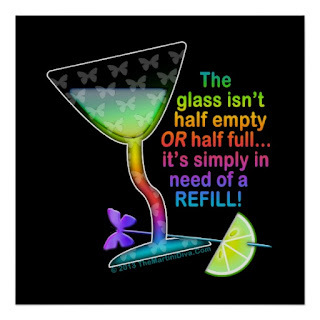 Of course, Martinis can't either and I don't advocate the use of alcohol as an anti-depressant or an escape from life. But I also don't think popping a pill is always the answer either. 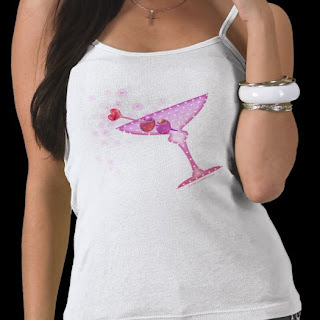 I do however believe that treating yourself to a little "Martini Moment" every once in a while and sharing the ritual of a cocktail or two with friends to celebrate life's achievements is a healthy activity and a lovely way to elevate your lifestyle - and your cocktail of choice can easily be a non-alcoholic Mocktail! 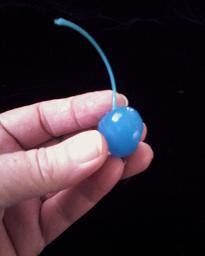 As for me, I would prefer a martini and a quiet moment of enjoyment and reflection on the day to popping a pill any day! Who needs Happy Pills When You Can Have a MARTINI is my humorous little illustration on today's current trend of trading a bottle of happy pills for yesterday's 2 martini lunch or 3 martini cocktail hour. 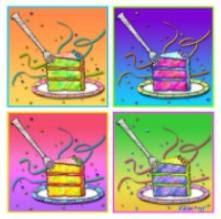 A little Mad Man - Sixties philosophy versus New Millenium philosophy.  Let's face it - neither happy pills or martinis are the answer to an unhappy life. 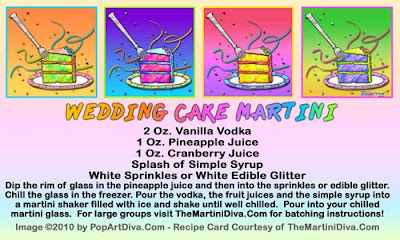 . . but at least martinis had some style. I never drink when I'm angry. I never drink when I'm sad. I never drink and drive. Do follow your doctor's advice whatever your persuasion, and never, ever mix both pills and alcohol - it's dangerous, even deadly and this is not a great lifestyle choice! You can't live a happy life if you're not here anymore.